Well hello ladies!! I can't believe it has been over 2 months since I have blogged. Wow how life has gotten away from me! But I am back and I have some great news for everyone :-) Llama Lacquers has a new Holiday collection based on the best Christmas story in the world, A Christmas Story. It has long been a tradition in my family to watch this movie only a few hundred times on Christmas day. I love the characters, the simple story line, and the awesomely descriptive and exaggerated voice over of an adult Ralphie. There were so many inspirations for this line I had trouble narrowing it down but in the end I went with some of the most famous parts of the movie. I have many pictures to show you and even a manicure for each. I am quite pleased with the outcome of these colors and I think they all look so festive! Take a look and then let me know what you think. So, which one is your favorite? These make great stocking stuffers in the minis and starting tonight I will have 15mL available! Cyber Monday sale starts tonight and everything will be 20% off. Also, the holiday collection will have a straight shipping fee of $2.50 no matter how many you buy. Hope to see you there!! Anyway, onto the nails. I really had no idea what I was going to do for E. I even posted in the Llama Nails group hoping to get some suggestions and I did. Some great ideas came my way, but none of them felt right. I finally decided that I was going to do eyes, but was stumped on how to do them (cause I felt like doing something pretty instead of cheeky or fun) Then all of a sudden a light bulb went off and I thought of the Eye of Horus. The history behind the eye of Horus, as with most Egyptian history, is simply too complicated to explain here so instead if you want to know more click on the Eye of Horus link. Then I realized, oh snap, Egypt starts with E also! I love everything Egyptian. I am pretty sure I was an Ancient Egyptian in a former life. I love the crazy mixed up insestuous lineage of the Pharoahs, the beauty and colors of their fashion, architecture, and art. I even love the mystery of the tombs and the aestetics of the heiroglyphic written language. I have been wanting to do Egyptian nails for a while now and its funny how I completely forgot that when it came time for week E.
For this manicure I started with a black base on all nails but the accent nail. I did my accent nail in gold and free hand painted the Eye of Horus (which looks good on my left hand, but the right leaves something to be desired) I then painted the tips of each of the other nails gold and free hand painted a intricate Egyptian inspired pattern into it with a teal color. I can totally see Cleopatra or Nefrititi wearing these nails. They are definitely fit for a Queen. I was super nervous about doing the tiny intricate design on my tips, but I think they turned out pretty awesome. I was unable to duplicate that design on the right hand...seriously how do girls do it! But it still matches. So pretty cool. don't ya think? Hello my dears! It feels so good to be able to write blog posts two days in a row. Especially since I've been so busy to begin with. I just love October. Halloween, fall, and so many birthdays that I know...including my own. This means the Sally's $10 off coupon :-) I have been eyeing the Wicked Collection from China Glaze for quite some time now, so I went to Sally's to purchase it for my early birthday present. I perused the shelves I was super disappointed when they weren't there and the sales lady said they weren't for sale. I then proceeded to pick out some other beautiful polishes to try to appease my sadness when from the back of the store I hear "Oh! We do have them!" Why the hell they weren't on the shelves I don't know. But she had to call her manager to see if she could sell them to me as the set. I still can't believe the price. 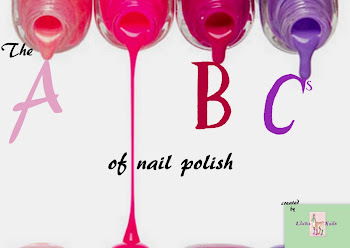 $8.99 for four China Glaze polishes. Awesome. And they are even more gorgeous in person. So, I had to do a manicure with them right away. I used Roguish Red and Bizzare Blurple over a NYC green. I did drips to make it look like I dipped my tips in some kind of ooey gooey goblin blood. Man I love Halloween and the fall. So much inspiration for cool nail art! I totally love these. Fun and icky at the same time. What is your favorite time of the year to get inspiration for your nails? On another note, I am so ridiculously happy at how my cuticles and skin look now that I have been taking better care of them. Can you tell the difference? This post has two agendas. #1 promote another of my Halloween Llama Lacquers. #2 Do a manicure for the Crumpet's Nail Tarts Halloween Challenge. I seriously can't remember the last manicure I did for this group. BTW....this is the group that did the Summer Challenge, previously named Purple Crumpet Fairy Challenge. It's kinda like Prince, the artist formerly known as Prince. Anywho. Today's challenge was black cats. I was tempted to use my one cat stamp, but as I just used it I simply couldn't do it. Instead I decided to make a zombie cat. I'm a little obsessed with zombies at the moment if you didn't know. Been watching season 2 of The Walking Dead on netflix and watching the Resident Evil movies. I have also been planning a zombie party that is going to be epic. So I've got zombies on the brains. BRAAAAAAIIIIINNNNNSSSSSS. Again, I digress. One of my Llama Lacquers polishes is called Pet Semetary (yes, I know how to spell. In the book, that is what the sign at the cemetery read) It is a silvery based polish with grey, green, and brown glitters. All the colors a rotting animal corpse would contain. Nice visual I know. I put this over a metallic green on all nails but the ring finger. This I put over a matte grey. I then hand painted a lovely little black zombie cat. He looks a little like a rabbit I'm afraid. I tried to make his one ear look like it had been chewed but instead it looks more like a drooping rabbit ear. Ah well, what can you do. It's a cat. I really dig (hehe) this polish and it is just perfect for a fall halloween manicure. I hope you like it too! Make sure to check out my other polishes at Llama Lacquers on etsy. Also, here is what the rest of the Halloween Challenge looks like. I am going to try to do as many as I can. It's getting harder and harder these days to do a bunch of manicures, but I will try. As always, thanks a bunch for stopping by. Check out the other beautiful black cats that some lovely ladies did. Ok, so on to my ABC challenge post. This week was the letter D, and once again I knew what I wanted to do from the beginning. I love a dotticure and there are so many different styles of it that I want to try. I know it is nothing original, but having polka dots dancing on my fingers puts me in a good mood. I decided to use some dark colors for this and they didn't show up as well as I would have liked them too, but I like it nonetheless. I am finding that because it is fall I have to use dark fall colors. No more pastels for a while. See, nothing too fancy. Space Cadet is actually a holographic polish that came in a french manicure kit and looks really cool in person. I couldn't get my lighting right and got a lot of glare. These were the best two pictures I could get. 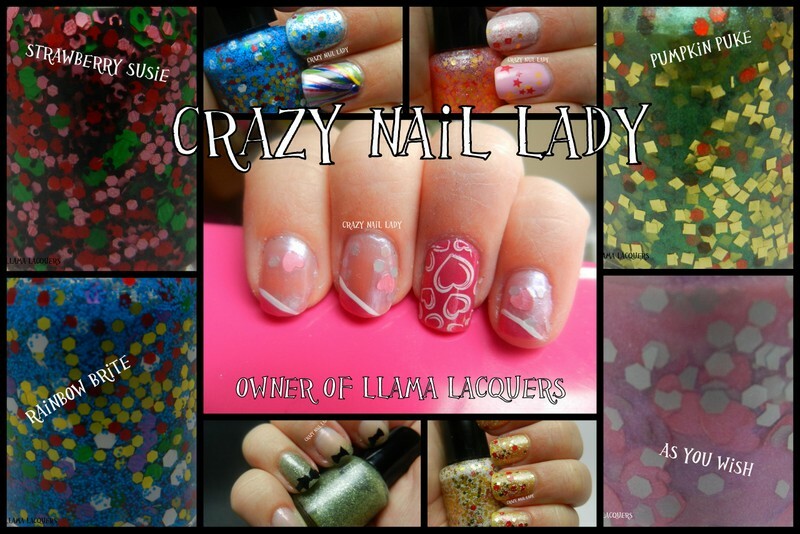 Today I have another Llama Lacquers for you. This was the first polish that inspired me to do the 80's female cartoon characters. Rainbow Brite is so very colorful and was a favorite of mine growing up. I was inspired by her bright blue dress with Rainbow colored puffs all over the sleeves and legs. I think this polish really resembles her. What do you think? I used NYC Cashemere Creme as my base coat and then attempted to do a rainbow like fan on the accent nail. The accent nail didn't turn out as I had planned, but it's not terrible :-P I added a blue rhinestone for one more special effect! So, I realize that in my last post I said I was going to take a break for a while. But guess what? I can't. I just can't leave my nails naked. It just won't do. Partly because my nails are yellow but mainly because I simply have an addiction. 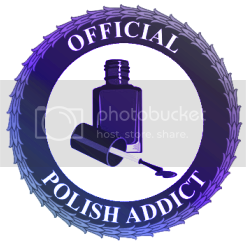 I just want to try out all my polish. And if they are naked, that will never happen!! Instead, I did a whole lot of research on taking better care of my cuticles and already they look better. I will post later about the things I am doing. But for now I want to show you another one of my Llama Lacquers. It just became my new favorite. She-Ra was my absolute favorite cartoon as a little girl. I loved everything about her and I was pretty sure that if I tried hard enough, raised that sword up into the sky with all my might, and said "By the Power of Grayskull. I am She-Ra" I would either turn into her or she would magically appear and become my best friend. How awesome would that have been!! Alas, it never happened. So I had to be content to ride her around on her beautiful steed Spirit and play in her castle and dream that I was the Princess of Power. For this manicure I didn't really need to do much. I put it over one coat of Sinful Colors This is It. (a beautiful color on its own I might add) The Llama Lacquers polish itself is a clear base with tiny white matt glitter, large red hex, square gold, and a few yellow hex. All colors of her outfit....the yellow for her long blonde hair. I feel like a kid again and maybe if I try hard enough, I will turn into She-Ra. I knew from the day I started this challenge I knew what I wanted to do for C. I love a colorblock manicure and I never do them. The first and the last one I did was for my trip to NYC and I got so many compliments on it. And this was before I was really any good at doing my nails :-P I also wanted to throw in another C word into these nails, but wasn't sure what. Cookies? Caterpillars? Caligraphy? Nope, Cats. Plain old cats. A black cat even....cause it's almost Halloween and I want to do everything Halloweeny right now. I really wanted to do some orange, green, gold, fall colors, but changed my mind in the end and went with some bold and darker colors. I think it turned out pretty great. The only thing about color blocking is that with adding so many colors it gets messy and requires a lot of cleanup which in turn dries out my cuticles. Other than that I really like this one. Its cute and a bit whimsical. What do you think? So, I am thinking about having naked nails for a while as I fix the dryness around my cuticles. They just look awful and even with a great manicure, all I can see is the bad cuticles. Other than that, I hope you enjoyed this one. I think it's pretty darn cute!! Thanks for stopping by and check out all the other Creative and Cute manicures. "Jem is my name. No one else is the same. Jem is my name" Sing it with me ladies. What 80's girl didn't love her some Jem. She was the oh so cool answer to Barbie. On top of it all she had pink hair. Awesome. So I have for you today a manicure using my new Llama Lacquers polish JEMtastic. When I set out to make this polish I knew it had to have pink and yellow. Light pink glitters for her hair, bright pink squares for her eye makeup, and of course some yellow to represent the star in her name. I just love this polish both in the bottle and on my nails. I wanted it to stand out so I used it over Orly's Decades of Dysfuntion which is a white polish with an almost lavender/pink tint to it. I also did an accent nail with stars. Cause JEM was a star!! If you like it and have to have it you can purchase it at my etsy shop, Llama Lacquers. There are four more polishes based on 80's cartoon females and of course my Princess Bride collection. Also, two Halloween themed polishes that are a little unusual.